For Immediate Release –In a time when jobs are in short supply, Vice-president of Client Operations for the Xerox Corporation, Gary Blackard, has just released a book that advocates the Bible as the best guide available for both employees and business owners to survive and thrive in a competitive job market. Entitled Relevance in the Workplace: Using the Bible to impact your job (Intermedia), the book covers many areas related to business and employment success, using the Bible as the main resource. As a long-time executive for Xerox, Blackard has over 20 years experience working with Fortune 100 companies across the globe, and is founder of Eagle Peak Leadership, a non-profit organization dedicated to helping business leaders in the U.S. and abroad integrate faith into their workplace. Relevance in the Workplace covers various topics including how to perform better on the job using spiritual disciplines, how to incorporate the Bible into leadership roles, and something Blackard calls the CE6 principles that relate to the customer experience. Blackard also makes the case that the Bible can help people be more creative in their jobs as well as lay a groundwork for strategic development in a company’s overall direction. Blackard uses an abundance of scriptures to back his thesis, and each chapter ends with discussion questions. Blackard will be a special guest speaker for two Assembly of God District Men’s Conferences in Baltimore and New York in October, and is also speaking at the Call2All Global Conference in southern California in November. Plans are currently in the works by Eagle Peak Leadership to do several “Relevance” conferences in select cities beginning in 2012. 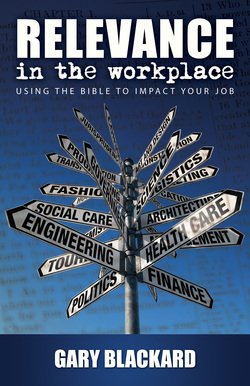 Relevance in the Workplace is available in print and ebook format via Amazon and Barnes & Noble. For more information, visit www.EaglePeak.org.